This piece by Mozart has a duration of 2 minutes and 30 seconds. The first two sections have lots of staccato and slurs, while the trio is more legato. There are some chromatic sections in the trio as well. The key signature of this piece is A major. The time signature is 3/4 like most waltzes and the tempo is Andantino. 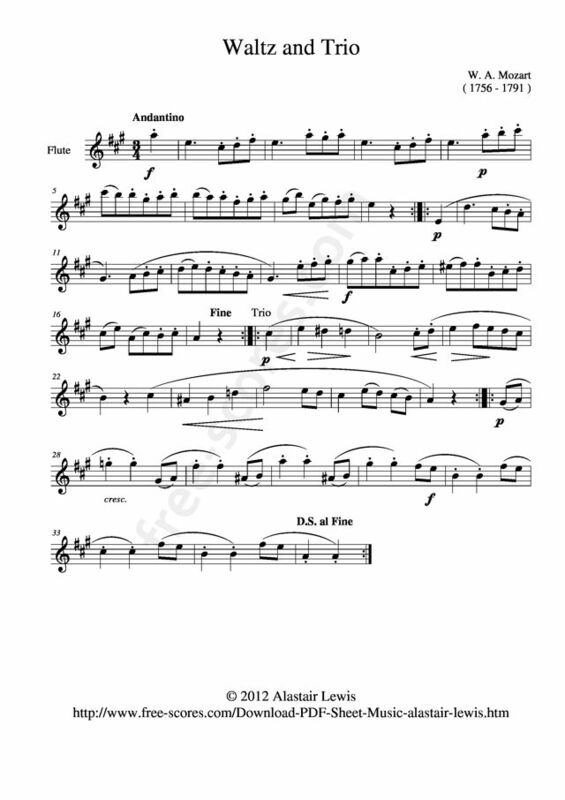 This is a free sheet music for solo flute. From his earliest childhood Mozart's prodigious musical abilities were evident. By the age of 5 years he had already begun composing. He played the violin and keyboard and performed before European royal families. Mozart was employed as a court musician in Salzburg when he was 17 years of age, he was however not content with this position travelled abroad in search of better opportunities. He eventually settled in the capital of Austria, Vienna, where he achieved fame but little financial security. He composed many of his best known music whilst living in this city, music which included symphonies, concertos and operas. Joseph Haydn wrote of Mozart that "posterity will not see such a talent again in 100 years." 23 scores found for "Waltz Mozart, Wolfgang Amadeus"